Prior to discovering her true artistic talents, Stephanie Tantillo of Satori Fire Glass spent 18 years working in the pharmaceutical industry as a production supervisor, manager and technical writer. During this time she also enjoyed working on several major motion pictures and can be seen in films such as The Fugitive, Sleepless in Seattle and the remake of a Miracle on 34th Street. Stephanie discovered her creative and artistic abilities through the inspiration of an incredible glass artist. She found several outstanding teachers to guide her into the processes of glass fusing. 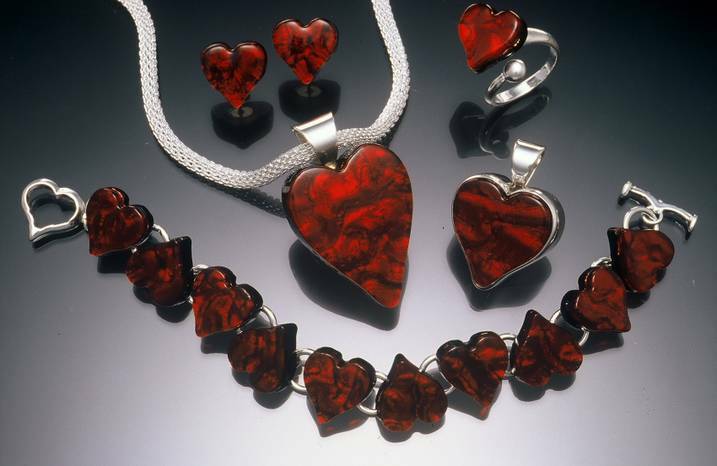 It was by applying what she had been taught and working with the media on her own that she has become proficient at the art of designing and creating glass jewelry. She has since become a skilled and passionate jewelry designer and glass artist. Her joy is in bringing the glass to life with the dramatic color combinations and elegant designs she creates. Much of her work is inspired by the colors of the ocean and her love of Hawaii. For the past 10 years Stephanie has worked as a full time artist. Initially, she worked from her studio in the Phoenix Arizona area where she created and sold her fused dichroic glass and silver jewelry. In August 2008 she returned to the area where she was born in McHenry County near Chicago, Illinois. 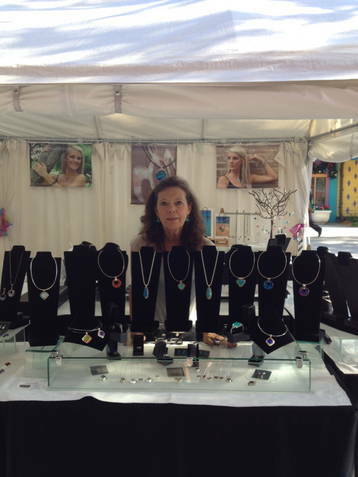 Stephanie continues to expand her art business through participating in numerous art fairs in the Midwest and most recently in Florida. Stephanie is known for creating the Satori Heart Collection and donates $1 from the sale of each heart to the Children’s Heart Foundation. Archeological evidence indicates that glass fusing can be traced back to the Egyptians (2000BCE). However some historians now say that the Romans who were prolific glass workers first developed the earliest fusing techniques. Modern technology has added spectacular color to this ancient art with the development of dichroic glass. Dichroic glass is created when thin layers of non-conducting metallic oxides are applied to conventional glass and processed in a high temperature vacuum furnace. Most pieces are a combination of dichroic, transparent and opaque glass. Although much more sophisticated, the process of glass fusing remains basically the same as it did in ancient Egypt and Rome. The glass is cut and layered. The layers are then fused together in a kiln at temperatures that can exceed 1500°F. Once the glass has cooled it is removed from the kiln and shaped into the desired design using diamond grinders and saws. The piece is then returned to the kiln to be fire polished at a slightly lower temperature than the original fusing. To achieve the optimum look many pieces go through this process three to four times. Fire polishing is done to give the glass pieces an elegantly smooth and finished look. Due to the nature of the glass, the fusing and finishing processes, each piece becomes a unique jewel reflecting its luminescent colors in the light. Finished pieces are then embellished with sterling or fine silver, semi precious stones or crystals becoming pendants, bracelets, earrings, hair adornments, rings and more. Satori Fire Glass jewelry is designed to be worn with the most casual to formal attire. Follow Satori Fire Glass on Facebook.